The best way of us introducing you to the Can-Do Child™ activities is for you to sample them yourself! 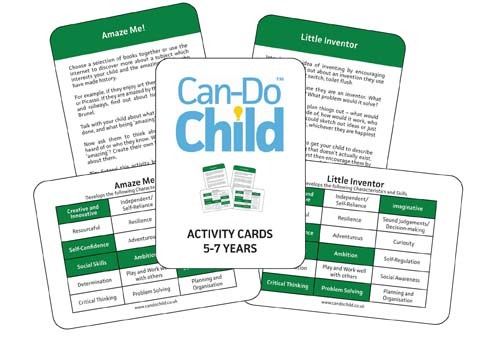 Endorsed by The Good Toy Guide, our activity card packs are the perfect solution for busy parents, educators, and anyone short on time and ideas, but wanting to help children develop essential life skills in a fun, easy way. Download the sample card content for free including activities for children aged 3-5 years, and 5-7 years. For 3-5 years we also have free content samples of the Easy Early Learning cards, supporting children's learning linked directly to the Early Years Foundation Stage Framework (you can found out more about these on our toolkit page). "What a great idea! I often struggle with ideas to keep the kids busy at home but keen to make sure what they do is helping them with what they're learning at school too. These are ideal." "I can't wait to try these activities out. So many of them are based around the things we do in our family everyday, I didn't realise how easy it could be!" "I love the quality of these cards, they feel strong like they won't tear easily and will withstand spills and muddy fingers." 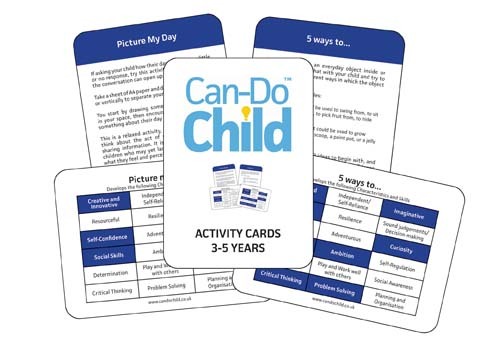 Based around everyday moments and situations, plus the occasional planned activity, Can-Do Child™ ideas need little or no planning or extra money. The sample activities illustrate the kind of enjoyment you can have nurturing children's can-do mindset, bringing together the three core elements of engagement, enterprise, and enjoyment. Every child is unique and therefore finding the style of language and interaction to suit your own situation and child/children is really important. The activities are not prescriptive, so you can find what works for you. Be inspired by the activities. Be inspired by your child. Discover your own unique way of making the most of your time together.